Create a gated community around your content with Restrict Content Pro. Membership sites are a great way to monetize your website. It lets you charge users for access to premium content, services, and products. Zuul Pro is all about quickly creating a site for your side project or business. Pair it up with Restrict Content Pro from the amazing people over at Sandhills Development and you can create a fully functional membership WordPress site. To get your membership site up and running there are just a couple things you’ll need. Our Zuul Pro theme has some key features that will help convert visitors to paying members. The featured section on the homepage is great for including a call to action driving users to our sign up page. Custom styles for registration pages make Restrict Content Pro fit in nicely with the rest of your sites aesthetics. Restrict Content Pro is a powerful membership plugins from.m Sandhills Develolment. They’re the same people behind Easy Digital Downloads and Affiliate WP. Their plugins are powerful and well coded. Restrict Content Pro offers great membership options allowing you to create multiple subscription levels to allow access to your sites content. With the theme and plugin in place the last thing you’ll need is a great idea. There are a ton of possibilities. You could offer premium courses to members. And drip the content with Drip Content add-on. Or you could give access to certain numbers of downloads each month when pairing with Easy Digital Downloads. You could even sign people up for real-world services like personal training. I’ve helped a friend setup Restrict Content Pro for just this purpose to great success. The main plugin we’ll need to get installed is Restrict Content Pro. It’s a premium plugin but well worth it for the features and support provided by the team at Sandhills Development. Now with our plugin installed we’ll need to create some membership Subscription Levels. These are the various memberships we’ll offer on our site and where we can control what level of access, user role, duration, and price of each membership offering. Restrict Content Pro has a few options for restricting access to posts. You can choose to restrict access of an entire Post Type to members by going to the Restrict Access menu item under each Post Type in the dashboard. Or you can control access to individual posts on the post edit screen. 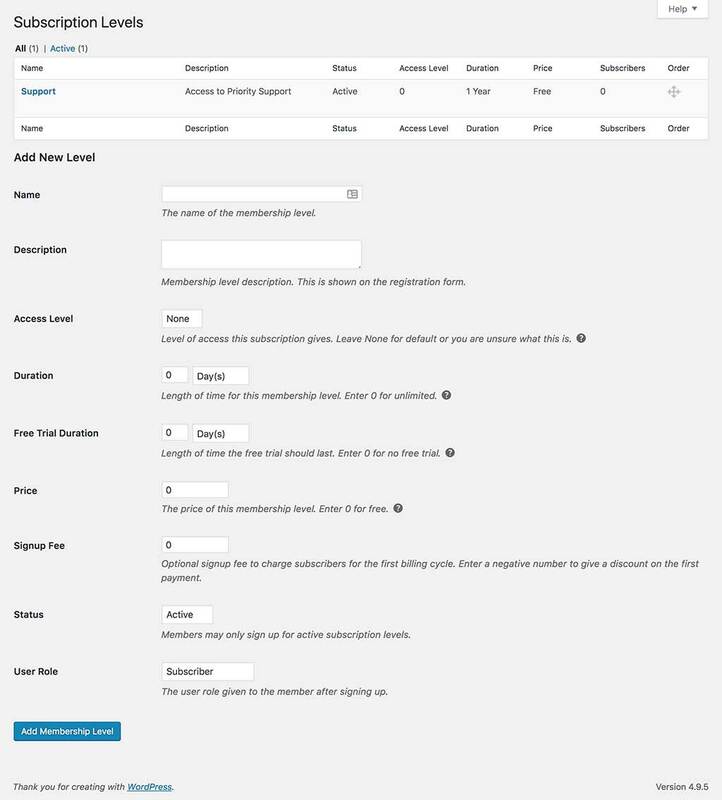 Better yet you can control the restriction to certain access levels, member roles, or subscription levels. Really letting you fine-tune who can access what on your site. Stripe is where it’s at. Easy to setup, the same fees as PayPal, and recurring payments. Yes, please. Of course Restrict Content Pro supports PayPal as well as other payment gateways. But, in my opinion, nothing beats the ease of use of getting things started with Stripe. One thing Restrict Content Pro doesn’t have out of the box is a snazzy pricing table layout. But not to worry. There are other great plugins just for that. Including the free Easy Pricing Tables from FatCat Apps. This plugin works extremely well with Restrict Content Pro and it offers some really nicely designed layouts. First up, you’ll want to create some landing pages that pull in the proper Restrict Content Pro sign up form. You’ll want to do this so when the user clicks your Gold plan they’re taken to the signup with that option filled in.
. Where the id is for the plan you want to include on the form. 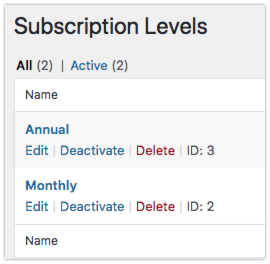 You can find the ID by hovering your Subscription level under the Restrict > Subscription Levels menu. Now you’ll want to create the pricing table with Easy Pricing Tables. You can get one started by going to Pricing Tables > Add New. Now just fill out the fields on the screen. Add some columns, names, pricing. features, and button text. Then for the Button URL you’ll want to use the permalink for the pages created for the individual register forms in the previous step. 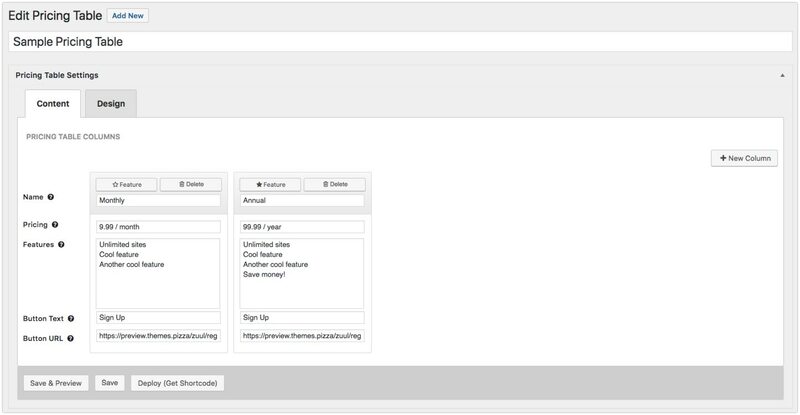 Zuul Pro comes with some great features to help you convert visitors to paying members using Restrict Content Pro. The homepage feature section and callout section allow you to drive users to your registration pages with custom messaging. The features section allows you to succinctly display the benefits offered by your membership service. And the homepage sections allow you to pull in any page content making it extremely easy to pull in a pricing table right on your homepage and drive sales. Plus with integrations with WooCommerce or Easy Digital Downloads you can improve your membership offering by giving out credits to free downloads or purchases, or even member discounts! If you’re a do-it-yourselfer grab a copy of Zuul Pro and get started. If you’re looking for help getting things setup contact me preferred developer about getting everything setup for you including Restrict Content Pro, hosting, and more.